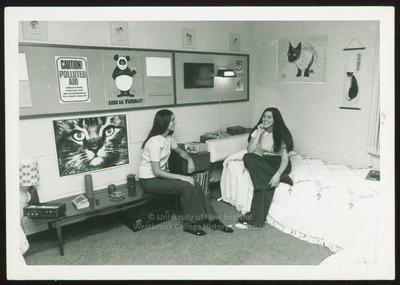 "Two Westbrook College Students Pose in Dormitory Room, 1974"
Two Westbrook College students, Anne Washburn and Laura Bendersky, Class of '74, sit on bed and bench in their dormitory room in this circa 1974 black and white glossy photograph. Both young women wear dark bell-bottom trousers and short sleeve sweaters. Their hair is long and straight and parted in the middle. The cinder block construction of the dormitory room suggests that the room is in either Ginn or McDougall or Linnell resident hall. It is furnished with bulletin board space and a carpeted floor. The beds have white chenille bedspreads. The coffee table/bench against the wall holds a lamp made from a Lancer's wine bottle.